I am having a hard time finding a place to start the rest of the story of my Nusbaum ancestors. I just keep going in circles and hitting walls. 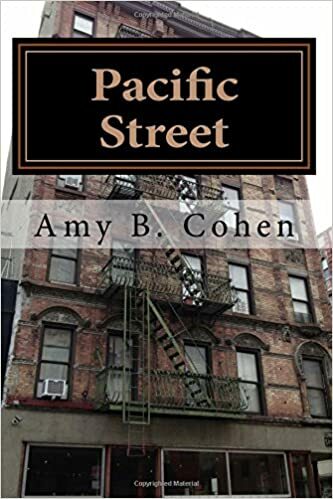 I have been able to locate most of the children of Amson and Voegele Nusbaum in the US, but for some have not been able to find very much about them. I am still searching and hoping more will turn up, but the Nusbaums seem so far to have stayed pretty much under the radar, unlike the Seligmans for sure and even more so than the Cohens, about whom I found a number of newspaper articles. So I will start with what I have and hope that as I go along, I will find more and learn more about the elusive Nusbaums. From the report compiled by Rolf Hofmann based on the research of Angelika Brosig, I know that Amson and Voegele had eight children. Guetel, the oldest, reportedly born in 1805, I have not had any luck finding either in Germany or in the United States. I assume she married in Germany since she would have been in her mid-thirties by the time her other siblings left Germany in the 1840s. Without access to marriage records or death records in Schopfloch, I have hit a dead end on Guetel. At least for now. I also have had no luck finding anything about Amson and Voegele’s fifth child, Sara, for what I assume are the same reasons. Sara, born July 8, 1812, according to Angelika Brosig’s research, also was probably married before her siblings left Schopfloch. Neither Guetel nor Sara appear in the Nusbaum family bible that belongs to my father, so I have to assume that they did not ever move to the United States. On the other hand, I was able to find all five of Amson and Voegel’s sons in the United States without too much trouble, and I even was able to find their other daughter, Madel or Mathilde. She was born on July 20, 1806, according to Angelika Brosig. My search for Mathilde was more successful than those for her two sisters because once again I was very fortunate to find someone who is related to me (and to Mathilde) by marriage. I had posted a question on JewishGen seeking help in researching my Nus(s)baum ancestors from Schopfloch, and I received an email from a fellow researcher, Ned Lewison, who said that he doubted that he had anything helpful, but that one of his relatives, Isaac Dinkelspiel, also with ancestral ties to Schopfloch, had married someone named Mathilde Nusbaum, and that they had lived in Harrisburg, Pennsylvania. (He also said that another relative had married another Nusbaum, but more on that in a later post.) I knew right away that that could not be just coincidence since I already knew that John Nusbaum had settled also in Harrisburg. Further research (to be described later) confirmed that Mathilde Nusbaum Dinkelspiel was John’s sister. So I know of six Nusbaum children who came to the United States: Mathilde, Leopold, Isaac, John, Ernst, and Maxwell. 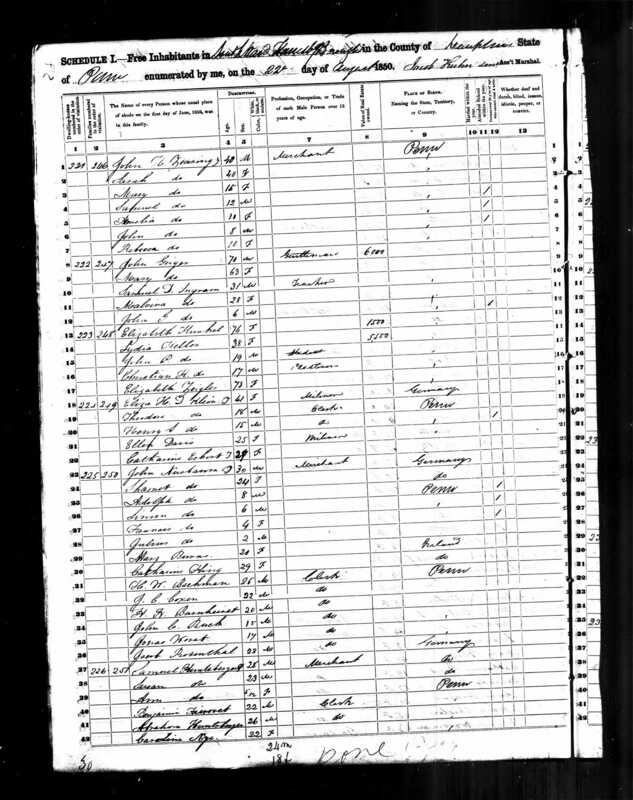 The earliest record I have found that might relate to my Nusbaum ancestors is an entry for a John Nussbaum on the 1840 census living in Harrisburg, Pennsylvania. Unfortunately, the 1840 census does not provide a lot of information. It only lists the male heads of household with check marks indicating the numbers of males and females within certain age ranges living in that household. The entry for John Nussbaum has check marks for one male between 30 and 40 years old, one female between 20 and 30 years old, and one female between five and ten years old. My three-times great-grandfather John Nusbaum would have been 36 in 1850, his wife Jeanette would have been 33, and they did not yet have any children that I am aware of. In fact, the family bible lists their marriage date as July 1, 1841 and their first child, Adolphus, born in 1842. Could this be my ancestor on the 1840 census? I am not sure. His wife’s age could be wrong, the family bible could be wrong about the marriage date, but who was the five to ten year old daughter? Could John have had another wife and a child before Jeanette? I cannot be sure. There are no birth records or death records on file in Pennsylvania before 1877 except for scattered church records and some local civil records. There are some marriage records, but they are not complete, and I cannot find any Nusbaum marriage recorded that early. I do know, however, that John was in Harrisburg by 1850. So maybe this is my ancestor on the 1840 census, maybe not. I have written to the local historical society in Harrisburg and hope to get some answers. 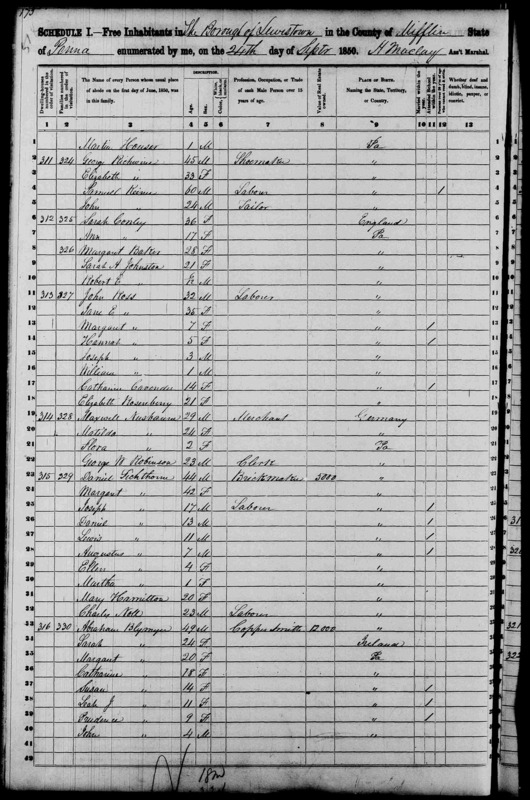 I cannot find any of the other Nusbaum siblings on the 1840 census. The next document I have that may relate to my Nusbaum ancestors is an immigration record for Leopold, John’s older brother. Since I only so far have the index entry and not the full ship manifest, this is also not a very helpful record. According to the index, a Leopold Nussbaum, aged 35, arrived from Germany to New York on June 9, 1847. The family bible does not have a birthdate for Leopold (though it does have his date of death). 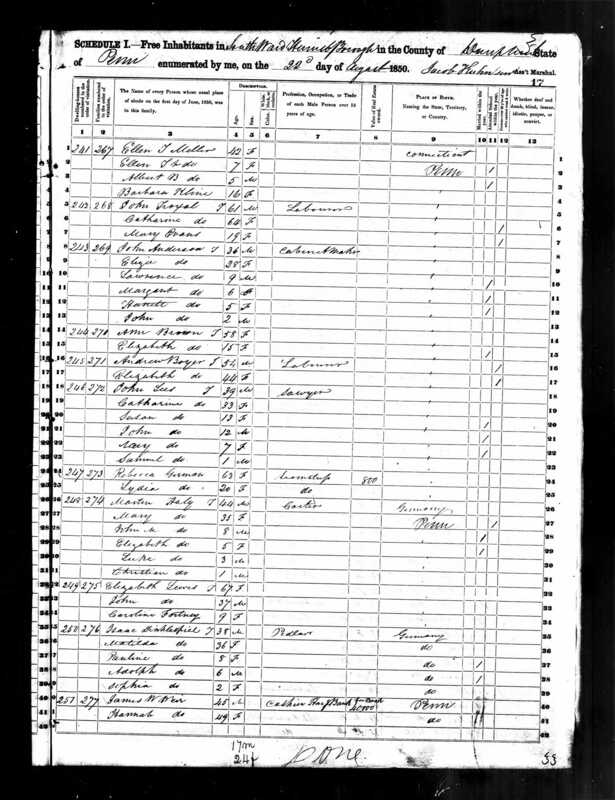 The Brosig records indicated that Leopold (Loew) was born on April 26, 1808, and the census records for Leopold in America conflict with each other, but suggest he was born between 1810 and 1812. I do not know for sure, therefore, whether this is the same Leopold Nussbaum, and perhaps seeing the full ship manifest will tell me more. But 1847 seems to be a reasonable date for the arrival of Leopold. 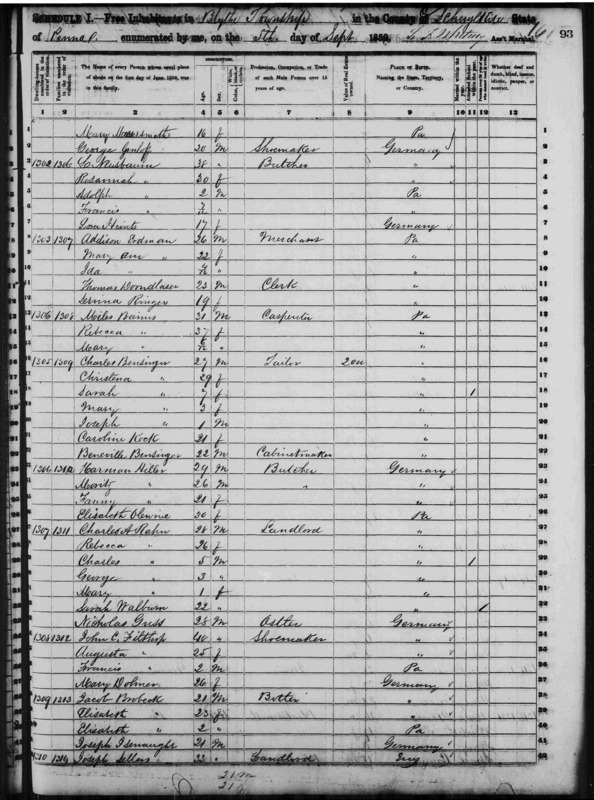 Although I have not been able to find any immigration records for any of the other Nusbaum siblings, I know that by 1850 four of them were already in the US because they appear on the 1850 census. John was living in Harrisburg’s South Ward and working as a merchant. He and his wife (listed as Shamet here) had four children: Adolphus (8), Simon (6), Frances (my great-great-grandmother, 4), and Julius (2), all born in Pennsylvania. They also had eight other unrelated adults living with them, two servants and six whose occupation was given as “clerk,” presumably in John’s store. So by 1850 John Nusbaum was quite comfortably settled in Harrisburg. As I indicated above, his older sister Mathilde was also living in Harrisburg with her husband Isaac Dinkelspiel. Isaac was working as a peddler, and he and Mathilde had three children: Paulina (8), Adolph (6), and Sophia (2). 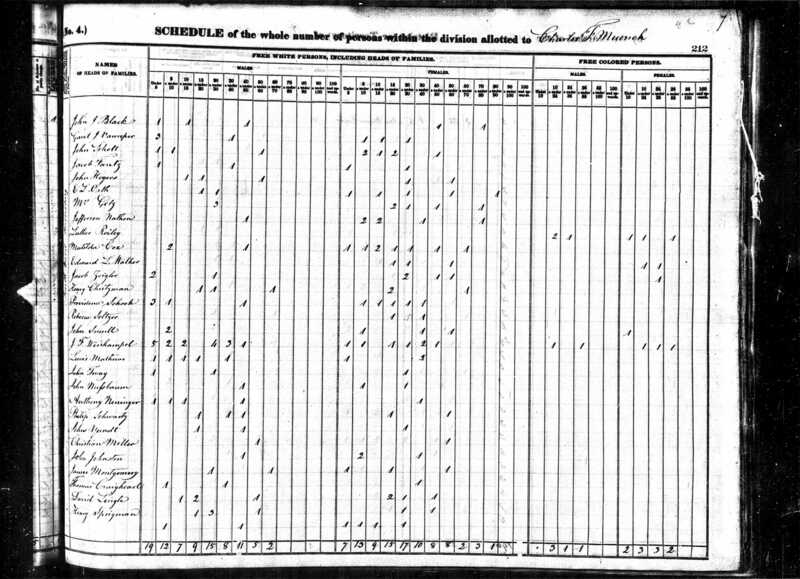 Since all three children were listed as born in Germany, this would suggest that Isaac and Mathilde had been in the United States for less than two years at the time of the 1850 census. Mathilde and her husband Isaac had no servants living with them and presumably were not yet as comfortable as her brother John and his family, who may have been in Harrisburg for ten years at that point. I did not find a definite listing for Leopold Nusbaum on the 1850 census, but I believe that this listing for L. Nussbaum is the right person. L. Nusbaum is listed as a butcher, 38 years old (which would give him a birth year of 1812), and married to Rosannah, both born in Germany, with two children: Adolph (2) and Francis (seven months), as well as a non-related person, perhaps a servant. Both children were born in Pennsylvania, meaning that Leopold and Rosannah had been in Pennsylvania since at least 1847, consistent with the ship manifest. They were living in Blythe, Pennsylvania, a town about seventy miles from Harrisburg. As for Isaac Nusbaum, the remaining sibling who emigrated to the US, I have no record for him before 1865 in Peoria, Illinois. I do not know when he arrived or where he was in 1850. Thus, what I know with a reasonable degree of certainty is that by 1850 (1852 for Ernst), John, Mathilde, Leopold, Maxwell, and Ernst Nusbaum had settled in Pennsylvania, John and Mathilde in Harrisburg, Leopold in Blythe, Maxwell in Lewistown, and Ernst in Philadelphia. What were they doing living in these places spread out miles from each other? In my next post I will address that question. The family bible says that Adolphus was born in Newville, Pennsylvania, which is about 32 miles from Harrisburg. Simon, Frances, and Julius were all born in Harrisburg. This entry was posted in Genealogy, Germany, Nusbaum, Pennsylvania, Philadelphia and tagged genealogy, Harrisburg, John Nusbaum, Nusbaum, Pennsylvania, Philadelphia by Amy. Bookmark the permalink. With your great sleuthing skills, I know you’ll uncover something. Thanks for the vote of confidence! I am trying to turn over every stone, but this is a tough group. Hurrah for JewishGen! How cool that you were able to connect the dots to Mathilde.